An uncontrolled outbreak of Ebola virus is currently underway in West Africa (Guinea, Liberia, Sierra Leone) with isolated cases in Nigeria. It is timely to provide an update on any clients or organizations approach to managing staff health and well-being and asset integrity. This information provides a summary of the status and an overview of any client& organization’s approach to managing the threat. International SOS maintains close contact with the WHO and relevant Government Health Departments to ensure that the impact of this information contributes to the advice provided in the website. As a reminder Ebola is a viral illness. The Ebola virus is contained in the blood and body fluids of infected people (vomit, diarrhoea, urine, nasal secretions, sweat, ejaculate). These fluids are contagious. If someone has contact with an infected person's body fluids, they can get Ebola. Unlike many viruses, such as influenza, the Ebola virus is not transmitted by air or by casual contact which means that unless you are providing caring for a sick or dead person you are most unlikely to become infected. 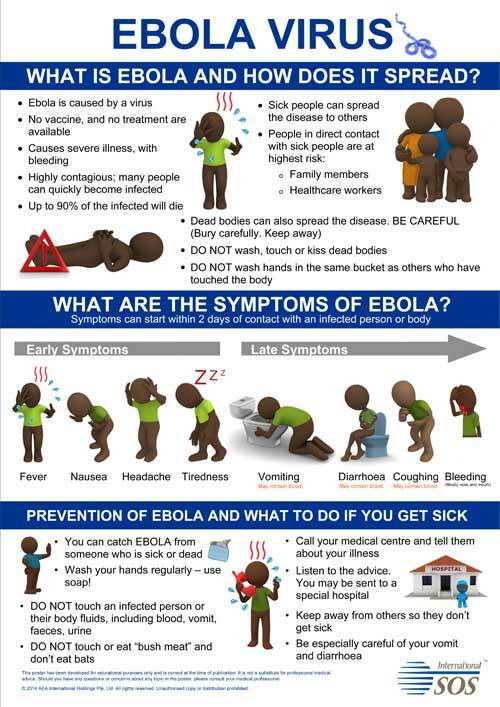 Prevention is covered in great detail on the Ebola website but essentially, keep away from sick people and do not touch their bodily fluids or objects contaminated with their fluids. Pay strict attention to hygiene. Wash your hands often. Even your company does not operate in the countries affected by the outbreak (Guinea, Liberia, Sierra Leone) and there is no evidence of community spread associated with the isolated cases identified in Nigeria. However, some countries are adopting defensive border control measures. The risk associated with staff deployment to non-affected countries in West Africa is perceived to be extremely low. However staff may be inconvenienced by these border controls and need to plan accordingly. Limitations on the movement of ill persons across borders as a result of control measures can affect medical management of non-Ebola illness including malaria which may present with similar symptoms. For this reason, our standard travel health precautions should be emphasised and staff should not travel when ill.
A common specific concern is the risk to other staff and family members from an individual who is returning from an affected area. Such staff is likely to have undergone port of exit screening prior to departing, will not be infectious unless they are visibly unwell (in which case they will not be at work) and, as referred to above, contact with bodily fluids from an infected individual is required for transmission.We are continuously monitoring the situation and, should the outbreakspread into countries where we operate, we shall provide further direct advice targeted to specific assets as necessary. A number of commercial airlines have suspended flights into and out of affected countries. Many countries have implemented temperature screening of inbound passengers, particularly for flights arriving from countries that have Ebola cases. The situation is dynamic. Currently travellers are strongly advised to defer non-essential travel to Guinea, Liberia and Sierra Leone. Anyone who is sick is advised not to travel to Nigeria. Disclaimer: This information has been developed for educational purposes only. It is not a substitute for professional medical advice. Should you have questions or concerns about any topic described here, please consult your health-care professional. Our appreciation to the Coordinating Doctors of International SOS, an AEA Company who have contributed this article in response to a health threat faced by expatriates in Indonesia.